Farmavita.Net member, has developed new medical device - Plungerless Pre-filled Syringe. Increased safety due to reduction in possible human errors in dosages. Also due to usage vacuum and Nitrogen there would be no air bubble. 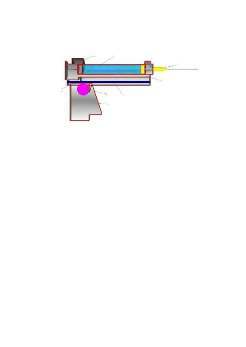 A trigger mechanism, designed to use magnetic energy, moves a piston inside the cartridge to inject and withdraw, eliminating plunger mechanism. All dosages come in a completely sealed cartridge that is placed into a trigger mechanism (injector). All dosages have an increased shelf life limited only by the stability of the drug that could be estimated (in the ideal conditions) in years, if not decades. This device is a syringe and a storage vessel at the same time. Reduced cost and storage space and simplified shipping and logistics achieved through eliminating of vials and ampoules and modification of the syringe filling and assembly process. The syringe features combine: pre-filled syringes, usage of empty and filled cartridges due to the piston movement in both direction; short drug shelf life cartridges (as presently used by dentists), simplification of the drug manufacturing process, less packaging, shipping, handling, storage and logistics. Also it could be used for liquid, powder and gas chemicals. Syringes will be pre-filled which would save critical time, assures accuracy and total compliance of medication (decreases human error and protects environment). Dual function of the completely sealed cartridges is that they can be used for collection of samples in cases of chemical and biological incidents. The Magnetic syringe is a patented device with a very quick turn around: With adequate seed capital, the product R&D should be completed in 3-6 months. The concept was presented to physicians and nurses and has met with enthusiastic reception. This paten is available for licensing out and all reasonable proposals would be considered.